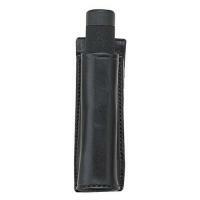 Keep an expandable nightstick secure and at the ready with the PatrolTek Leather expandable baton holder from Bianchi. This popular, genuine leather holder secures to duty belts up to 2.25" or 58 mm in width and includes a dependable one-way directional snap to provide added strength and durability for long-term wear. Choose from holders that accommodate either 21" or 26" expandable batons. Manufactured with Bianchi's quality gun leather and available in basket weave or plain finishes, this baton holder serves as part of the PatrolTek line--a line known for tactical performance at a budget-friendly price point.